Simply put, a Reverse Mortgage has pros and cons to it. Here, we’ll simply focus on the potential reverse mortgage cons. We’ll highlight the pros of reverse mortgage separately on a different page. If a reverse mortgage loan advisor tells you there are no cons to reverse mortgage, should you believe him? Let’s think about that for a minute. After all, every loan program has some pros and some cons to it. For example, is a 15 year fixed loan a bad thing? No, it’s not necessarily bad, but perhaps the payment might be too high for some individuals or families. Perhaps in this case, a 30 year fixed would be more suitable. The same theory can apply to the home equity conversion mortgage. 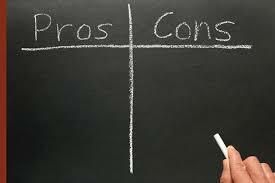 As the great scholar and psychiatrist Sigmund Freud once said, “when making a decision of minor importance, I have always found it advantageous to consider all the pros and cons”. Naturally, the same logic should be exercised when making big financial decisions surrounding your home. Consider the good and part about reverse loans, but don’t forget to take into account the Reverse Mortgage Cons. The loan Balance Grows. The first of the reverse mortgage cons is that since there are no monthly payments on the loan the loan balance will grow. This is how the homeowner is able to NOT make a monthly payment. In terms of this reverse mortgage drawback, you just have to decide what’s more important to you. Is it more important to preserve your home equity? Or, is it more important to preserve your day to day cash flow since you don’t have a monthly mortgage payment? A Reverse Loan will decrease your home equity. This goes along with the first pitfall we mentioned. Since the loan balance grows, it means your equity may be decreasing. That just depends on whether you choose to make payments or not. It also is dependent on whether home prices are increasing, decreasing, or have been flat for some time. The interest rate is often times a variable interest rate. In terms of whether this is a true con, it’s a gray area. Most Home Equity Lines of Credit have variable interest rates, so it’s not unique revers loans. The way it can potentially be a con is that if interest rates do rise, it will decrease your equity more quickly. In doing so, it will reduce your heir’s inheritance. The closing costs can sometimes be higher than a traditional mortgage. The key word here is “sometimes”. There are quite a few variables that impact the cost of a reverse mortgage. These variables are the initial loan balance at closing, amount owed on the loan you’re paying off vs total available HECM loan amount, etc. While the costs can be more, a no cost or almost no cost loan can sometimes be available. Find out more about the cost of from Reverse Mortgage Loan Advisors at info@ReverseMortgageLoanAdvisors.com . If you move, the loan becomes due. This loan is only intended to be on your primary residence. If you move out permanently, the loan becomes due (within a prescribed time frame that is pretty reasonable). You’d either have to pay the loan off with the proceeds of the sale of your home or by refinancing the loan or other liquid assets. A Reverse Mortgage could impact certain government assistance programs. The reverse mortgage does not impact your social security income. Similarly, it does not present an issue in regard to your Medicare eligibility. However, it may affect certain programs like SNAP or food stamps or cash aid. Check with the government provider to see what potential consequences a reverse loan may have. Imagine this scenario; you’re a married couple and one of you is 62 plus, while the other is not. Prior to August 2014 a homeowner could choose to take the loan in only the older homeowner’s name. Hopefully, their loan officer would explain the ramifications of doing this, but I’m sure there were cases where they did not. Before August 2014, the younger spouse could end up stuck, without a place to live if the older borrower died first. You see, back then only those that are on the loan (age eligible) could live in the home for the rest of their lives. Things are different now. Several younger, surviving spouse that ended up getting foreclosed upon sue HUD. You see, they were not on the loan when their older spouse did the reverse loan. Since there were not on the loan due to their age, they could not live there forever. Due to this lawsuit, HUD / FHA changed the rules. On any loan originated after August 2014, both spouses can live in the home for the rest of their lives. This holds true even if both spouses are not age eligible. That was a nice victory because this was probably the biggest flaw in my opinion. The aim of this Reverse Mortgage Loan Advisors is to provide unbiased information about reverse mortgages. Not just the good, but also the potentially bad. This page is all about the not so perfect aspects of the reverse mortgage. Visit Pros of Reverse Mortgage for more info about the upside of reverse mortgages. Click Here to Get Your FREE Info Kit! FYI – At no additional cost to you, we may receive a commission when you click on links in this website. Reverse Mortgage Line of Credit Explained – Yay or Nay? Can You Do A Reverse Mortgage With Existing Mortgage Loans? ( With Reverse Mortgage Examples )? www.ReverseMortgageLoanAdvisors.com Is not a lender, bank, or mortgage broker, nor is it affiliated with HUD or FHA. Reverse Mortgage Loan Advisors is simply a website designed to offer information about the FHA insured reverse mortgage program. However, the owner of the site is licensed as a reverse mortgage specialist in several states. Anyone that inquires and requests more information may be contacted by the owner of this site. If the owner of this site is not licensed to conduct business in the state you reside, one of our affiliates will contact you instead.